Not a whole lot of knitting this weekend around these parts. I did not even touch Astrid two. I needed to get a couple of other projects going. 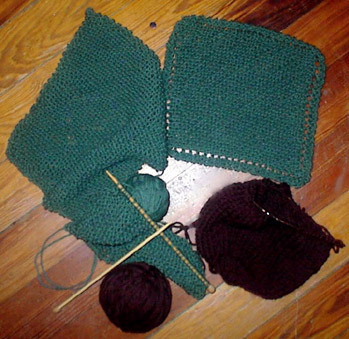 I started another All Around Companion bag, this time in dark brown Paton's classic wool. I have never felted with Paton's wool so I hope the pixies are on may side once felting commences. A friend at work has been wanting a few cotton dishcloths as well. I just love these things in the kitchen. I live in SW Florida, about 3 hours south of where you're going to visit. Our weather has been gorgeous here. We're in a cool snap right now, lows in the 40's, highs in the 70's. Sunny skies and a gentle breeze. It's perfect. I love your cabled scarf pattern, and will check your sidebars to see if you are offering the pattern. If so, I'll swipe it. Maybe I'll see you in FL. My partner and I are going down to a wedding this weekend. But Northern Florida - St. Augustine. Hope the weather stays warm. Are you bringing your knitting on the plane? Max, I've used Classic Wool for a few felting projects and have always had great results. I'm sure you will, too! Bought for myself last week, Xerox -canon mf 4450, cartridge ran out and what to do now ? Only found here - http://www.filpan.ru> refill cartridge canon mf 4450. They can buy the cartridge canon mf 4450 factory quality ! I bought a cartridge canon mf 4450, Quality is very happy !